An interesting article in the Telegraph, makes a mention of Ibn Taymiyyah. Is reproduced here out of interest. There is a mention of Ibn Battuta in the article so we should note that there is a fabrication against Ibn Taymiyyah in the writings of Ibn Battuta which has been employed by the gnostic, esoteric Sufis to attack Ibn Taymiyyah - that is for a separate article. Many people have been killed in Syria. Its president, Bashar al-Assad comes from a family that is Alawi by religion, even if the Baath party, which he leads, is secular. So, what do Alawis believe in? Some say that the Alawis, one in 12 of the Syrian population, worship Ali (Mohammed's son-in-law) as God; that they believe in reincarnation; that they deny women have souls. A reputable work like the Oxford Cyclopedia of the Modern Islamic World (1995) explains that they are "extremist Shi'is" whose "religious system separates them from Sunni Muslims". On the next page it suddenly says that they "also celebrate Mass, including consecration of bread and wine". The one certain thing is that, like the Shia, who have also gone through repeated persecution, they follow the practice of taqiyya, usually translated as "dissimulation". The Alawis keep their central beliefs secret and verbally profess beliefs they do not hold. One must be careful here, because an esoteric religion like that of the Alawis often uses strongly metaphorical terms. Indeed, their enemies (whose accounts are the fullest) complain of just that. So Ibn Taymiyya, a fierce jurist of the 14th century, much loved by wahhabi activists today, called the Alawis "greater disbelievers than the Jews, Christians, and Indian idol-worshipping Brahmans", since they used the pillars of Islam to cloak their own beliefs, meaning by "fasting" keeping their secrets or by "pilgrimage" visiting their sheikhs. Ibn Battuta, the wonderful traveller who lived a little later in the 14th century, wrote that they believed Ali was God, that they did not pray ritually, or practise circumcision or fast. They did not attend mosque or keep in repair mosques built for them, he said. Those historical sources give them the name Nusayris, after a follower (in the ninth century) of the 11th Imam of the Shia. The name Alawis is regarded as politer. 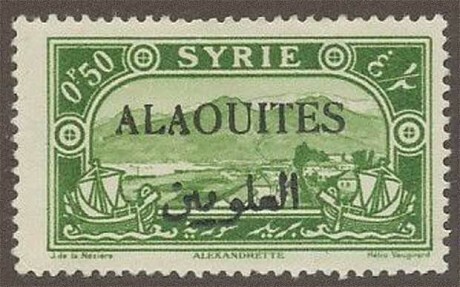 When, in 1925, the French set up an Alawi state, they overprinted Syrian stamps (pictured) "ALAOUITES". To English readers they became familiar as Ansaireehs, through a popular book by the Rev Samuel Lyde, a Church of England missionary who lived among them in the 1850s. His book The Asian Mystery came out in 1860, the year of his death, aged 35. Lyde tried to bring Christianity to the Alawis. Life among them convinced him that they resembled the heathen of whom St Paul wrote: "filled with all unrighteousness, fornication, wickedness, covetousness, maliciousness" etc. It was no frame of mind to win Converts, even if they had been amenable to his message. Lyde very much disliked their brigandage, feuds, lying and divorce. On their secret practices, such as their "Mass", he is unreliable, depending on written sources. Even by his own account its ritual was a consecration of wine relating to Ali and God, not to the life and death of Jesus. But at least Lyde had seen their mountain life of poverty (which he found less hungry than in many an English city) and harsh treatment by officials of the Ottoman empire. I mention Lyde because his colourful account still exerts a strong influence, being widely referred to on the internet. Just as false an idea of Alawi belief is to be had by claiming it as a survival of Zoroastrianism or making it an Ismaili sect. If, as is claimed, it sees Ali as the meaning (mana) of God; Mohammed as the name (ism) of God and Salman al-Farisi (a Persian companion of Mohammed's) as the door (bab) to God, then the Sunni are right to think that the Alawis are not Muslims.